Music is our way to communicate what we hold in our hearts. It is a blessing to us when we touch others, share our hope and communicate the joy we have found. We were called to minister through our music in 2002. God gave us many confirmations that this was our calling. First there was the encouragement we received from our many good band-friends and festival promoters. Marilyn's beautiful voice and clearly understood lyrics received continual compliments. The witness of a husband-wife team singing gospel music with harmony and joy drew listeners to them wherever they performed. In the year 2000, Marilyn began to receive songs. Original lyrics and melodies would come to her in the middle of the night. Most of these songs were gospel in content. It wasn't long before the collection grew to over 150 songs. Why did God give her these songs? Did He mean for us to share them? 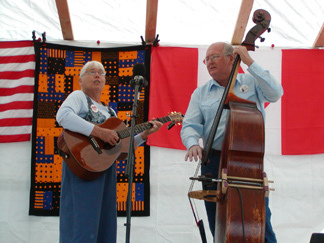 In June of 2002 while camping in Toronto, Canada we met a lady who was attracted to our music. As we conversed she told us about a Bible conference in California (our home state) that she thought we would enjoy. We attended the conference and the message spoke directly to us, giving us courage to step out and follow God's calling. Then we received a copy of the book Purpose Driven Life from an old friend who we had not seen in 40 years. As we read the book we were amazed as the thoughts expressed coincided with God's leading in our lives. This book reaffirmed our calling to move forward and share our music. Everything seemed to be coming together at once and we felt compelled to step out on faith. At first it was not easy for us, but God smoothed our path. 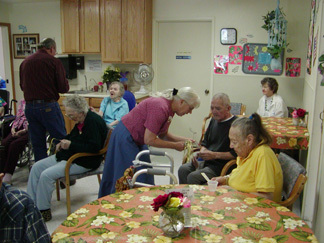 who are confined to retirement and care centers. 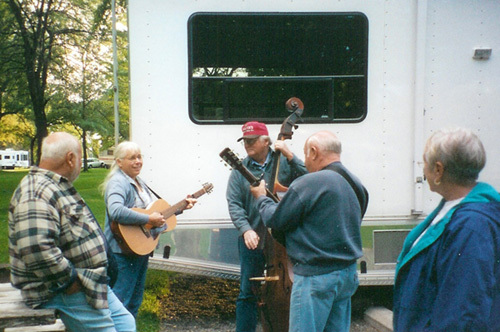 We enjoy reaching out with our music at Bluegrass festivals. The Sunday program gives us a chance to share our bluegrass gospel music and many of Marilyn's original bluegrass gospel songs. Camping out over the weekend offers opportunities to touch other campers with our message through songs. Wherever we camp we play our music and enjoy sharing with other campers. Often we will meet a new musician and our music draws people to our campsite where we get acquainted and reach out to them. 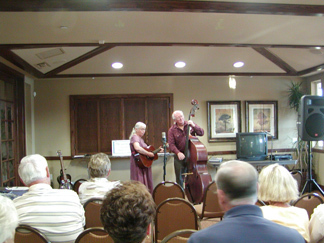 We share our music at churches, retirement homes, convalescent hospitals, festivals, campgrounds, jamborees, fund raisers, special events and private gatherings. 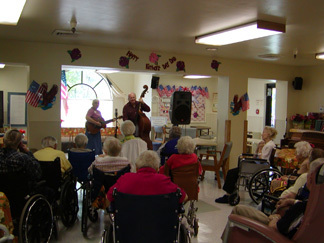 Audiences continue to grow and our joy overflows with love as we share our music. Wherever we play we set up our display table. 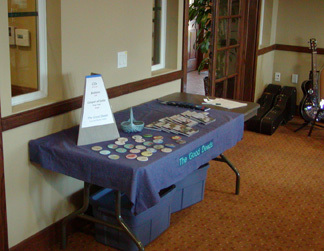 We have produced three CDs and make inspirational buttons for both musicians and non-musicians. There is a sign-up sheet for our email newsletter. Our business cards and brochures are available. We also have free booklets of the Gospel of John called Living Water and bookmarks with Bible scripture.